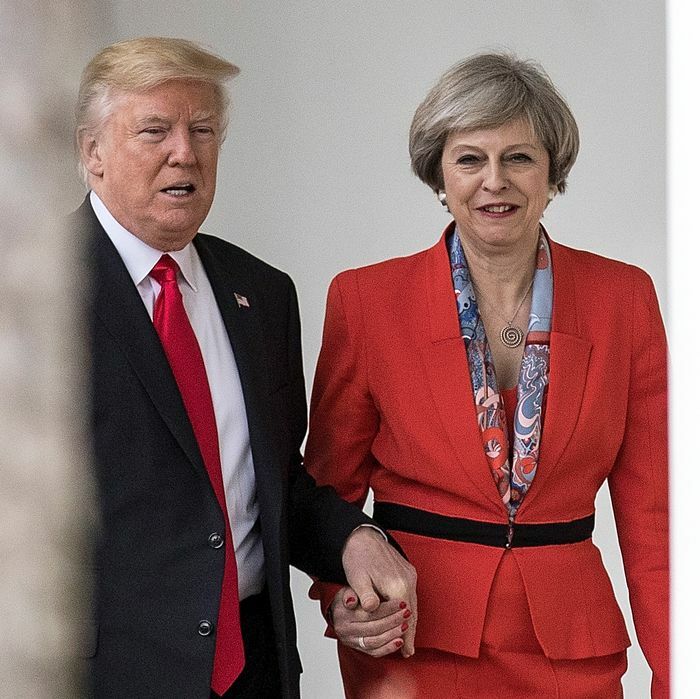 Things seemed rosier for both May and Trump when they met at the White House in January. Just a few months ago, it’s worth remembering, we seemed to be careening to a new and possibly long-lived right-populist era in Anglo-American politics. In the U.S., Donald Trump had stunned the world and his own party Establishment by seizing the nomination of the GOP, and then defeating the overwhelming favorite, Hillary Clinton, to win the presidency. In Britain, a referendum on Brexit had shocked and overturned the British and European Establishments, and dispatched Prime Minister David Cameron to the bucolic shires whence he came. The uninspiring but dogged Theresa May emerged as Cameron’s successor, after her Tory male rivals had out-machoed and out-plotted each other into mutual destruction. And both Trump and May seemed to have captured a restless, rightist mood in the American and British publics, as Reagan and Thatcher had before them. Trump had endorsed Brexit and May, in turn, had been the first foreign visitor to the White House, desperate for a new U.S.-U.K. trade deal. Although many of us believed that Brexit was understandable but irrational and that Trump was a catastrophe just waiting to unfold, the people of the two countries begged to differ. Except they didn’t entirely, did they? Trump, it’s always worth recalling, lost the popular vote 46–48 percent. Brexit passed only narrowly, 52–48 percent. Both countries, despite the top-line results, remained deeply divided — riven by the cleavages of globalization and its discontents. And now, it’s clear, the divisions have not evaporated and the opposition has revived, with increasingly robust energy. This week, Trump slumped to the lowest approval ratings of his term — in the upper-to-mid-30s — while being called a liar by the former head of the FBI. And May was humiliated — there is no other word for it — by the British voters in a snap election. In the wake of Brexit and Trump, the forces of reaction in Europe have also seemed to recede. The far right gained but didn’t triumph in the Netherlands; Le Pen, while winning a historic level of support, faded in the home stretch. And now the British have actually made it conceivable that Jeremy Corbyn — the most left-wing leader in the history of the Labour Party, a sympathizer with Hamas and the IRA, and an old-school “unelectable” hard-line socialist — could be prime minister in the not-so-distant future. Maybe Bernie could have done it, after all? And maybe this result, just as Brexit foretold Trump, could presage a Democratic swing in the House next year? After this British turbulence, anything is surely possible. But there were some specific American parallels to May’s defeat that are worth noting. She ran an Establishment campaign shockingly like Hillary Clinton’s in an era when populism can swing in all sorts of unlikely directions. She began with the presumption that she would coast to victory because her opponent was simply unelectable, extremist, and obviously deplorable in every way. She decided to run a campaign about her, rather than about the country. She kept her public appearances to small, controlled settings, while Corbyn drew increasingly large crowds at outdoor rallies. She robotically repeated her core argument that she represented “strong, stable leadership,” with little else to motivate or inspire voters. She chose to run solely on Brexit — and the hardest of Brexits on offer — while Labour unveiled a whole set of big-spending, big-borrowing, big-government policies that drew a million new younger voters to the polls. It was Clinton 2016 all over again — with the same dismal result. May’s campaign compensated for her weakness by mercilessly trashing Corbyn’s record and politics, and was amplified by a chorus of near-hysterical tabloid anti-Corbyn excess. After a while, the Brits felt it was overkill, and the underdog Corbyn, always mild-mannered and never personal in his attacks, gained unlikely sympathy. And then she simply screwed up. She put herself forward as strong and consistent, and yet she had promised for months that she would not hold an early, snap election, only to break her word. She then swiftly reversed herself on a core policy idea — that seniors would have to reimburse the government for home care from their own estates — upsetting her elderly base, and then stupidly refused to admit she’d performed a U-turn. She decided to skip the televised debates, and thereby looked defensive and weak. She came across as less authentic than Corbyn, and much less comfortable in herself. When you look at the polling, it’s no surprise to see the biggest shift in voting intentions in any election campaign in British history. From almost the moment the election was announced, Labour soared. The 20-point gap narrowed to a few within a little over a month. Hers might have been the worst campaign in modern British history — just as Clinton’s was on this side of the pond. And on the critical issue of Brexit, she underestimated the ambivalence in the country as a whole. She mistook 52 percent for a national consensus. In London and the Southeast in particular, those who voted Remain in the referendum — or who intended to but didn’t — came out in force to oppose a hard Brexit. The millennials actually turned up this time. In a student town like Cambridge, for example, the Labour majority went from 599 to more than 12,000 — a staggering leap. Labour, moreover, shrewdly didn’t run to reverse Brexit, and were thereby able to siphon off some pro-Brexit working-class voters from the swiftly collapsing UKIP. What all this means now that Article 50 has been triggered to kick off the Brexit process is anyone’s guess. But among those celebrating last night were surely Emmanuel Macron, Angela Merkel, and the EU elite. This could put Brexit back in play, and certainly destroys May’s credibility in the looming negotiations. It’s therefore a near certainty now that she will be gone in short order. The tabloid press this morning is already after her, and the ruthless Tories will follow. A possible replacement: the young lesbian leader of the Tories in Scotland, Ruth Davidson, whose success north of the border may well have kept the Tories from an even worse result. And that, indeed, was another surprise: the parties in Scotland that favor keeping the union with England won twice as many votes as the Scottish Nationalist Party. This was a vote for keeping the entire country together and for less of a rush to get out of the EU (and even perhaps a second referendum). It was a populist wave … for the recent past. The populism we’ve seen bolster the right, in other words, is a fickle beast. What this election shows in Britain is that after years of austerity and neoliberal economics, there is also an opening for a left-populism, at least in Europe. Whether it can win outright is another question. But what it has been able to do is to tip Britain into an unexpected political impasse, to give it a parliament where the Tories will not be able to sustain a reliably pro-Brexit majority for very long, and to make it all but certain that another election will at some point have to be called, possibly in the fall. What the result of that will be is something I will not safely predict until the morning after — except that Corbyn will be running, and May won’t. And there was a lovely resonance, don’t you think, that this shocking reversal for right-populism came on the very same day that President Trump was definitively shown to be more than worthy of impeachment. I’ve long been a skeptic of some of the darkest claims about his campaign’s alleged involvement with the Russian government — and possible evidence thereof — but I’m not skeptical at all of the idea that he has clearly committed a categorical abuse of his presidential power in his attempt to cover it up. This sobering reality was not advanced by the Comey hearings yesterday, riveting though they were. We have long known that Trump colluded with the Russian government to tilt the election against his opponent — because he did so on national television during the campaign, urging the Kremlin to release more hacked Clinton emails to help him win. We also know that he fired FBI Director James Comey in order to remove the cloud of the Russian investigation from his presidency — because Trump said so on national television himself and then boasted about it to two close Putin lackeys in the Oval Office! But the details to buttress this picture add weight and texture to all of it. Comey credibly asserted that the president asked for personal loyalty to him, and not to the Constitution; that Trump sought leverage over Comey in a highly inappropriate private dinner for two; that he cleared the Oval Office of everyone else so that he could ask Comey alone to drop the inquiry into former national security adviser Michael Flynn’s contacts with Russia; that when Comey refused to obey, the president fired him; that when asked why he fired him, the president openly cited the investigation into Russia; and that he then brazenly threatened the FBI director if he spoke the truth about their interactions in hearings or the press. Or look at it this way: We now have a witness of long public service, clear integrity, with contemporaneous memoranda and witnesses, who just testified under oath to the president’s clear attempt to obstruct justice. Any other president of any party who had been found guilty of these things would be impeached under any other circumstances. Lying under oath about sexual misconduct is trivial in comparison. So, for that matter, is covering up a domestic crime. Watergate did not, after all, involve covering up the attempt of the Kremlin to undermine and corrode the very core of our democratic system — free and fair elections. Even conservative commentators have conceded that if this were a Democrat in power, almighty hell would have already been unleashed. We wouldn’t be mulling impeachment. It would already be well under way. The “defenses” of the president are telling. Republican senators were attempting to parse the words “I hope” yesterday in a manner that made Trump’s aspiration to get Flynn off seem like an innocent musing directed at no one in particular — when it was directed alone in private to the man running that investigation. Please. The Speaker of the House then tried this one on: “The president’s new at this. He’s new to government and so he probably wasn’t steeped in the long-running protocols that establish the relationships between DOJ, FBI, and White Houses. He’s just new to this.” Excuse me? Someone who assumes the office of the presidency without knowing that we live under the rule of law, and who believes that the president can rig the legal and investigative system to his own benefit, has no business being president at all. This should not be part of some learning curve. Not knowing this basic fact about our constitutional democracy — something taught in every high school — is ipso facto disqualifying. If the president doesn’t know this, he doesn’t know anything. And if he can violate this clear, bright line, he can violate anything. What chills me even more is how Comey of all people was clearly intimidated. He didn’t threaten to resign; he didn’t immediately cry foul; he appealed only to Sessions, who rolled his eyes. This “cowardice” — to use Comey’s own term — is from a man who stood up to a previous president under great duress in the emergency of wartime. Imagine how many other functionaries, less established and far weaker and less pliable than Comey, will acquiesce to abuse of this kind, if it is ignored, enabled, or allowed to continue. And yet Trump remains in office, hoping that our outrage will somehow be dimmed by his shameless relentlessness and constant distractions. In classic Roy Cohn fashion, he is now, through his thuggish lawyer, calling for an investigation into (yes) Comey for his leak of his (unclassified) memoranda as a private citizen. He will say or do anything — and yes, lie through his teeth repeatedly — to obscure the reality in front of our eyes. But we need to be clear about something. If we let an abuse of power of this magnitude go unchallenged, we have begun the formal task of dismantling our system of government. This is not a legal matter — dependent on whether you can convict someone of a specific crime. This is a political matter — and of the gravest kind — about whether we wish to sustain our liberal democratic norms. Do we Americans have sufficient integrity to do this, and to reverse the drastic error we all so recently made? Maybe the British have just showed us that, yes, we can.